Online printing company UPrinting.com* is back with another giveaway! I've used UPrinting many times in the past, and everything they have done for me has looked awesome! UPrinting.com is sending me some of these Card Magnets as a thank you, and I haven't really decided yet what I want to make with them. Gonna have to give it some thought! Leave a comment on this post saying how you would use the Card Magnets if you won. Deadline for entry is 11:59PM Central time April 7, 2011. Good luck, y'all! *This giveaway is sponsored by UPrinting, no monetary compensation was given and I will receive business card magnets for hosting. 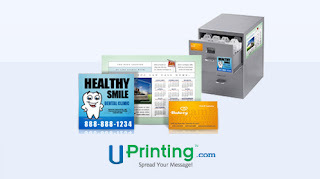 Check out more about UPrinting on Facebook and Twitter.